Редкий питомец, появляющийся в самых разных уголках Таладора. Одновременно во всей зоне может находиться только один такой питомец. Багровокрылый мотылек появляется в Таладоре (Дренор) и только один на всю локацию единовременно. Сама поймала в точке 49.4 85.8. Выносим макрос на панель и спамим при поиске. Написано редкий, но за 30 мин. сервер Гордунни найдено 2 мотылька, при вялом поиске, т.е. бегал от нечего делать. Есть мнение, что найти его при желании не составит большого труда. Спасибо ivo1ga'e, за координаты. Не попадается вторым питомцем в битвах. P.S. Только если битва не начата с самим мотыльком, тогда может прокнуть до 3 в пачке. Багровокрылый мотылек is a rare spawn in Таладор with many spawn points but only appears once at a time similar to the Unborn Val'kyr of Northrend. Credit goes to Savagelove and other posters. Wait... Unborn Val'kyr style pet with reused model and fairy standard moth abilities? I really hope it's a placeholder. Багровокрылый мотылек in Talador @ 46, 85. Screenshot to confirm. Found one @ 36, 64. Found one at 57, 55. Found another at 72, 41. Found another spawn point at 55.6, 17.2 on the Orunai Coast. Below is a list of all of the currently reported spawn points for those avidly searching for this lovely little critter. Used Lil'Taregosa to capture mine. Just remember to be a gentle touch given how this one is set up to spawn similar to Unborn Valkyr. Only 1 up in Talador at any given time. 33, 79 is where I found mine, forgot to take a screenshot before the battle but took it right after without moving. Good luck! found one @ 71.85, 41.32, was spamming /tar Crimsonwing while taking flight path. Found mine where the Pet Tracker addon told me other moths spawned, and all the other coords I saw posted here seemed to reflect that as well - think it spawns in replacement of other moths. Definitely in replacement of other standard pets in the zone. Found at 65 50. Poor quality, but whatevs, I'll just buy a stone to upgrade. Is there a way to trigger the spawn? Or is there a timer? It looks like the moth takes the place of a different pet in the zone and there are not "set" spawn points. I happened to find mine at 63.8, 60.5. I found one at 43, 93 - the square of land west of Telmor, bounded by paths on the north and west (just east of the path that leads into the far west corner of Spires of Arak). Found mine tonight near the Shattrath FP @ 51, 39! Use as a macro with tom tom addon! It seens that this moth spawn in several spots around the entire map, she is always UP but only one is up per time. Care, Безрассудный удар can be deathly sometimes. Not mentioned yet. Make sure you use the cords only as a guide, they can spawn all over the place. Best tip I can give: Find a spot and server hop. 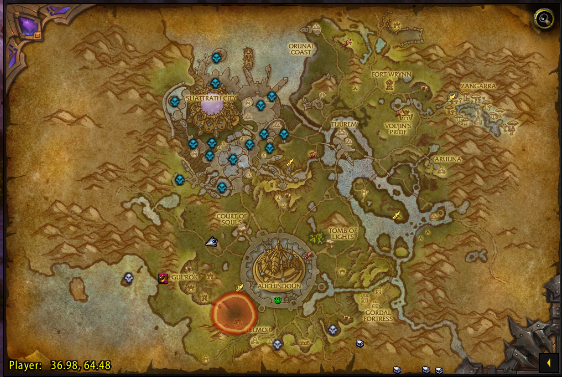 There is no reason to go running to each spawn point looking for it when we have the group finder tool. I found the Crimsonwing and Sapphire Firefly this way took several hops but i didn't have to run around looking for them. Just caught a White B/B breed a the western shores @39, 91.Used the Aviana's feather method to survey large areas quickly + targeting macro. I found one by arch of sha'tar! about 51.5,31.07 today used the feather like some1 posted flew around with macro /tar crimsonwing moth kept tapping /tar and bam i got 1 happy hunting ! After running all over the map checking the spawn points listed on the map above as well as the points listed from the PetTracker addon, I finally found mine at 75.1, 18.1. I figured I'd add it in here. 70, 38.5 - south of Vol'jin's Pride just off the road between Tuurem and Aruuna. Natural Rare, B/B. I had suspected from capturing the Sapphire Firefly that the moth too would be within easy reach of the roads, ensuring at least a modicum of safety and convenience for pet hunters. The theory seems to prove out. I went to 57.0 55.0 and used the target macro I made. I went to group finder and started using the Group Finder for those offering their garrison, just like I did for the wasp from Spires. After 5 realm hops, there he was and I started the battle to get his health low enough to cage. I had a Terrible Turnip on the team, but I had not swapped him in yet. Even tho it appeared there was no way my pet could get close to killing it, yup dead as a doornail. I could have cried. What a noob error. I left the group and continued my search. Three realm hops later there it was again. I made sure not to assume anything and I caged a Poor quality, but have plenty of stones to upgrade. My personal opinion, is to find a spot, realm hop and hope for the best. It worked for me with the wasp and the moth. Found mine at 61,55.Location not marked on wowhead's map. I think I'll wait till flying gets here before trying for this one. edit: was super easy to get with flying. This is one of two new rare spawn pets added in 6.2. The other one is Sapphire Firefly in the Spires of Arak. Here's a list with all present spawnpoint accoring to wowhead users. TomTom and pastebin addons for ease of use. Enjoy! Found one at 53 23 coast of Talador (Orunai Coast). Took me less than 5 min to find it after I came here to get coordinates. Got breed H/S poor quality. can confirm 70 / 38, I just caught mine here a few minutes ago via realm hopping. There's a great addon for this, named "Cross Realm Assist". It automatically queues you for every group in tool with auto invite activated and you'll never join the same group twice. With the advent of flight in Draenor, I decided to look around for this and Sapphire Firefly. I had put this off for some time, but figured this would be a good time to look. To my surprise, I was able to find both pets within a few minutes of each other and from this it seems that they do not share a spawn timer. Meaning, if you find this pet in Talador, you don't have to wait to go look for the other in Spires of Arak. Just found mine at 70.87, 54.06 Realm hopping is definitely the way to go, only took like 5 realm hops. Saw this pet I hadn't captured before along the Iron Horde landing beach. Was only uncommon but I wanted to add it to my collection. My Feline Familiar had a bonus damage move and a normal damage move, so I used the normal one. And of course it crit and I one-shot the uncommon quality pet. Came here to find out how irritating it is to find them. Bad kitty! Nowhere near as hard as the Val'kyr, so no need to worry :) It took me about 5 minutes running around aimlessly, didn't even load the coords. I'm on a high population server (Area 52-US) and there was no competition. Remember to realm hop that if you have any trouble. Just found mine at 50,30 near the Arch of Sha'tar. For developers looking for this pet's species id it's 1589. 66,36 dead on. Thank you! The moths, rats, snakes, squirrels, rabbits, beetles and such are all horrible and they should feel bad for even existing. It appears this pet may be seasonal, such as the Owls of Winterspring. As of 12 days ago, no-one has made a new comment regarding this pet. After 6 hours of flying around the entire zone, including clearing of pets so that new ones spawn, no sightings. Considering the seasonal change was days ago, it may not spawn during Winter. Can anyone confirm this? Confirmed not a seasonal item got mine after just a few minutes of looking! Captured my Crimsonwing Moth this morning 7:48am eastern time at 49.35, 85.87. I had given up on capturing it after days of flying around Auchindoun in a circle, using my target macro. This time I decided to just work on my Draenic Pet Battler achieve, so I just stayed in this area on foot, battling all the moths in the area (there were so many in close proximity that it was idea for the achieve). About 5 month battles in, I saw it spawn! Clicked it, captured it, and feel very luck today - finally! The spawn of this is probably rigged. Even if it were unique it probably favors spawning near a player. Many people here report getting it very easily. Just found my first one, and it was a rare at 1:52am (4:52 am server) at 64,60. I didn't have to search at all. Wowhead is currently missing breed infos of this pet. According to WarCraft pets, this has 2 different breeds (H/S) & (B/B). Edit: I just happened to capture another one of these pets. Thid time it was a P/S breed. Not sure how many breeds are there, but will keep updating info if I find more. So far I have B/B & the P/S. It was Poor quality but I'm really happy I found one. Found mine right at 49.59, 85.39 in the southern part of the map. just caught one of these today and in doing so i was also awarded a flawless battlestone. I don't see any cheevo that woulda have triggered the reward. Spawned within 5 circles of Auchindown, I killed all the other battle pets to force it. Excellent place found 2, mins apart not up at the same time. I flew the circle on the map and started @ 32, 63 going counter-clockwise. I didn't get him until I reached 55, 17. Green rarity, Blue would have been nice. You know I must have flown around Talador 6 times. Then I realized that I kept missing a waypoint off to the edge of the map. Sure enough, the Crimsonwing Moth was there. Unbelievable. Этот NPC может быть найден в следующих зонах: Таладор (23). Нежные и опасные, блестящие и смелые, чистые красавцы, стоящие равного им по весу клада целого. Жаль, что они весят не так много.